Iraq war veteran, Sgt. Kelly Foster, first purchased his ’65 Mustang back in 2005 after his first tour of duty with plans on restoring the classic vehicle. Over the years, Foster had been paying little by little to get it fixed up at a Pearland, Texas auto shop. 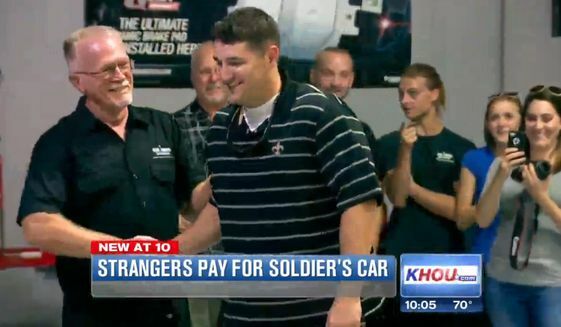 Well, earlier this month, Foster was amazed to walk in to the auto shop to find that strangers had paid nearly $20,000 to have the Mustang restored. Spearheaded by Margaret and Timor Martin, donations were collected from approximately 35 local community members. The Martin’s said that their drive to get the money together stemmed from their deep appreciation of U.S. military members. Both come from strong military families. Walking into the auto shop, Foster thought he was just going to be visiting his work in progress vehicle. Instead, he found it restored to near mint condition. He was so excited by the sight that he couldn’t help but hug the Martins. This entry was posted in Culture and tagged 1965 Mustang, Margaret, Pearland, Sgt. Kelly Foster, Texas, Timor Martin. Bookmark the permalink.